This Sign Hardware for Ceilings is Ideal for Large Frames! Each Hanging Kit is Reasonably Priced! 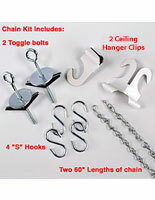 When In Stock Sign Hardware for Ceilings will Ship Fast! 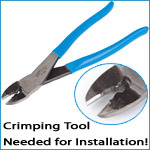 Kit includes (1) 16' monofilament line, (8) clamps, (2) toggle bolts, (4) S-hooks. 200 lb line can be cut to any length by customer. This sign hardware for ceilings is affordably priced. The low cost and flexibility is just a couple of the reasons these kits are so popular, they are also easy to use. This sign hardware for ceilings comes with instructions to help consumers in the quick and simple installation. This sign hardware for ceilings is aesthetically pleasing for any store. Suspension kits are ideal for displaying ads in a storefront window. 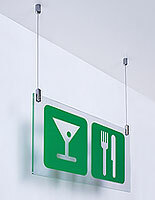 This sign hardware for ceilings, referred to as a poster hanging kit, is often preferred over the other mounting sets on the market because of the transparent line. Some of the businesses that use these hanging kits are department stores, large concert halls, and much more. 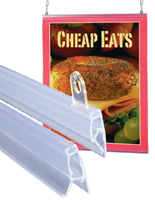 This poster display mounting set is sign hardware for ceilings that is heavy duty enough to hold most frames. Despite the delicate look of monofilament line it can hold light frames, to heavy LED light boxes. 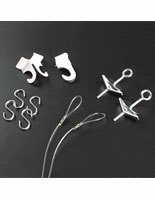 Each hanging kit is sign hardware for ceilings that consumers choose the length of the line. 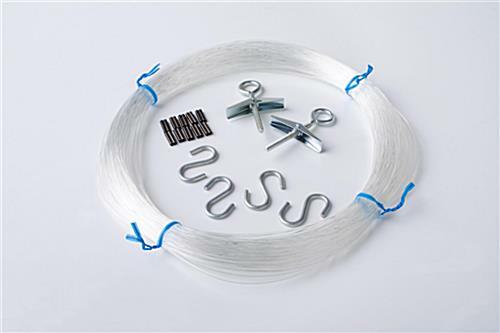 These sets for suspending a sign in a store comes with (1) 16' clear monofilament line so whether users need it 2' or 6', they will work great. This suspension kit is sign hardware for ceilings that comes with (8) copper sleeves for making the hanging loops at the desired length. Many other window display kits come in predetermined lengths, so users are forced to place their ads at specific heights. This sign hardware for ceilings gives consumers more flexibility. The only tools required for completing the hanging of a sign display is the frame itself, a clamping tool and a drill with a 5/8" bit (both can be purchased at your local hardware store). 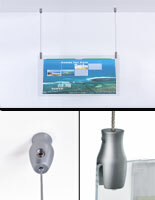 Buy a hanging kit and display signage in any storefront window.